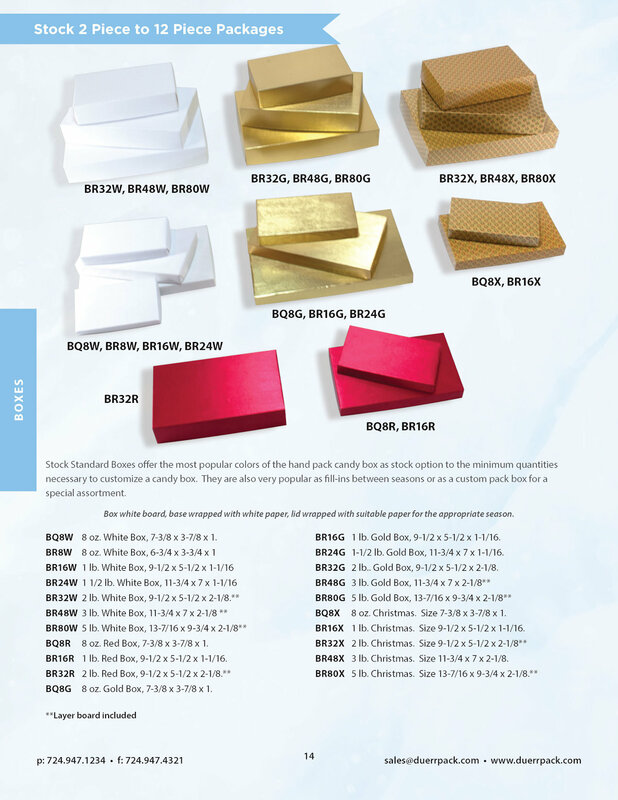 TStock Standard Boxes offer the most popular colors of the hand pack candy box as stock option to the minimum quantities necessary to customize a candy box. They are also very popular as fill-ins between seasons or as a custom pack box for a special assortment. Box white board, base wrapped with white paper, lid wrapped with suitable paper for the appropriate season. 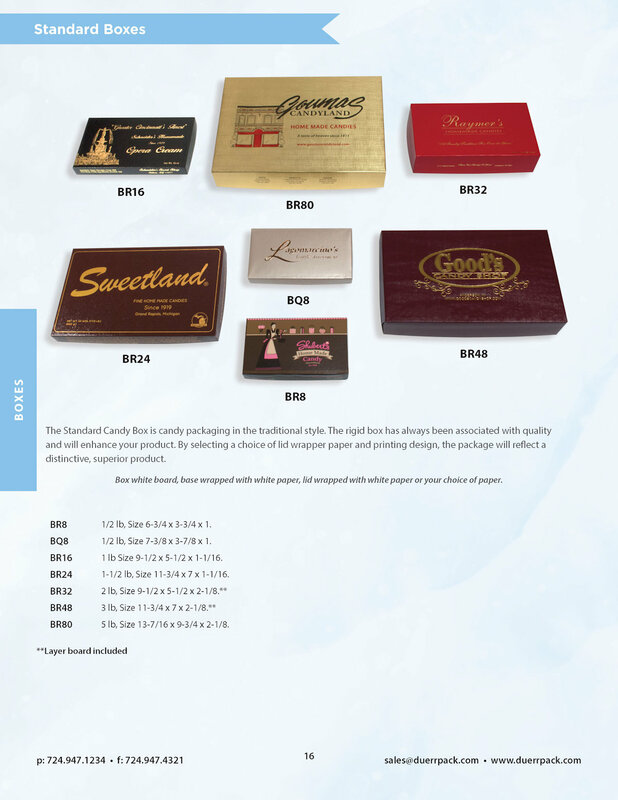 Stock Tray Boxes provide the candymaker with several options for packaging chocolates. All these items are prepacked in corrugated cartons and available in small, case quantities. 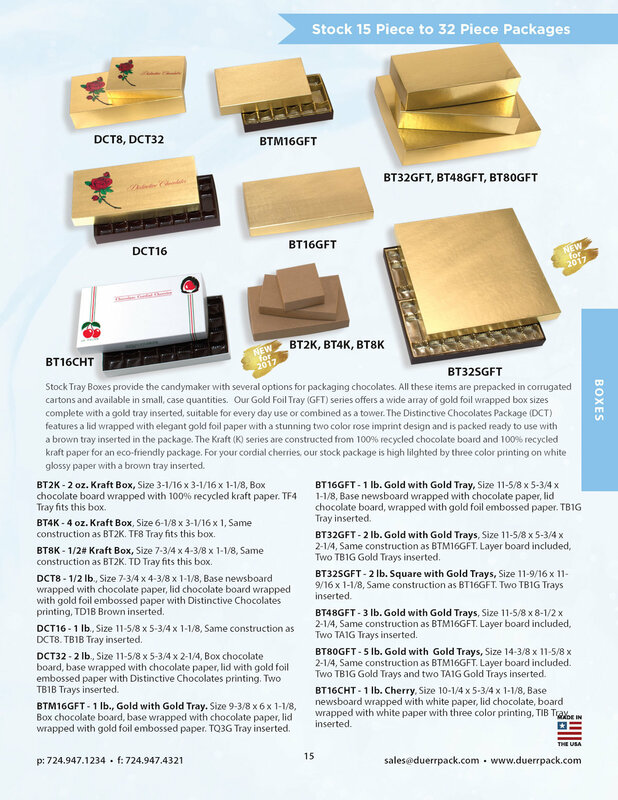 Our Gold Foil Tray (GFT) series offers a wide array of gold foil wrapped box sizes complete with a gold tray inserted, suitable for every day use or combined as a tower. The Distinctive Chocolates Package (DCT) features a lid wrapped with elegant gold foil paper with a stunning two color rose imprint design and is packed ready to use with a brown tray inserted in the package. The Kraft (K) series are constructed from 100% recycled chocolate board and 100% recycled kraft paper for an eco-friendly package. For your cordial cherries, our stock package is high lilghted by three color printing on white glossy paper with a brown tray inserted. The Standard Candy Box is candy packaging in the traditional style. The rigid box has always been associated with quality and will enhance your product. By selecting a choice of lid wrapper paper and printing design, the package will reflect a distinctive, superior product. Box white board, base wrapped with white paper, lid wrapped with white paper or your choice of paper.